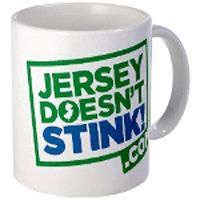 Speaking of stinky New Jersey (and we do beg to differ with the childish new PR campaign showing up on coffee mugs all over . . . the advertising agency’s office) there are new developments in the case of February’s million-dollar perfume heist in the Meadowlands. Two more perps were arrested today and brought to Federal court in Newark where their indictments were unsealed. Jerry DeMarco of the Cliffview Pilot has the juicy details.